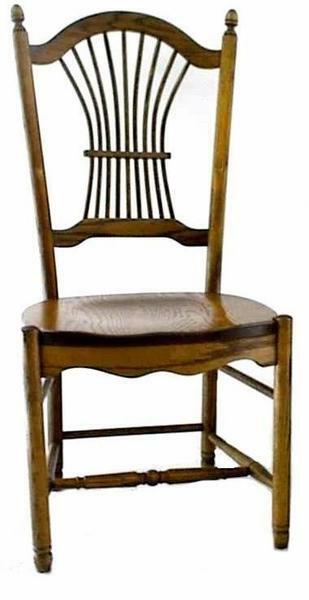 A popular style for bright country style kitchens and dining rooms, the Amish Furniture Ohio Sheaf Back Dining Room Chair offers a beautiful display. Add comfortable side and arm chairs to your kitchen or dining room with this exquisite woodworking shining strong. Fitting for both elegant and casual occasions, the sheaf back showcases Amish woodworking with a flourish. The chair back features the slimmest of spindles gathered as in a bundle of grain. The chair crown is rounded perfectly and the chair skirt waves and ripples. These gorgeous country style chairs feature elements of colonial style furniture with their graceful design made for function. These wood chairs are part of the Ohio Chair Collection that offers customizations to fit every taste and lifestyle.